Spending some time up in Angels Camp this week with my Mom. It is always good to get away and visit with family. I always take my Janome with me when I travel- there is always some time to work on a project or two. So this week I brought the paper pieced forest animals for my new granddaughter's quilt. I was able to get four of them completed last night. Just have to draw in a few of the details. There are 8 more to go. I am also working on the lay out in EQ7 and have settled on a couple of design choices. Hope to have all the blocks finished this week and start putting it all together when I get home. Hope this finds all of you working on something fun this week. Check out all the other great projects at Patchwork Times. Those are so cute. 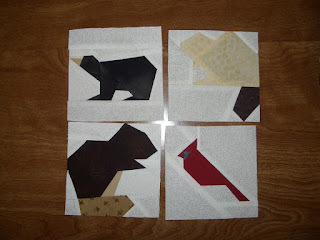 I'm not a big fan of paper piecing, but you sure do a great job of it. Looking forward to seeing the whole quilt put together. This will be a darling quilt. Made by a very proud grandmother. I know it will be given with a lot of love and hugs. Look forward to seeing the completed quilt.